Between caving in Puerto Rico, driving cross-country with Jessica, and visiting Yosemite with my mother, 2014 was a busy year for adventuring, and I still had one adventure left! My mother and step-father live in Florida during the winter, so that means I get to jet south to warmer weather every Thanksgiving. This year, I decided I wanted to use the break as an opportunity to get outside. So, I planned a trip into The Everglades. Let me first clarify what The Everglades is. The Everglades is an enormous wetlands area that functions like a slow moving river. When Lake Okeechobee overflows, the water enters The Everglades ecosystem and slowly makes its way towards Key West. 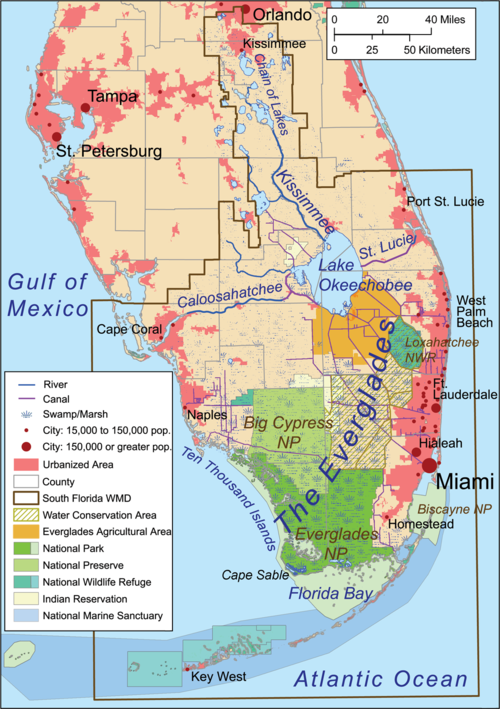 Everglades National Park contains a portion of The Everglades along the coast near Florida Bay and Ten Thousand Islands. While I had previously been to The Everglades on a fan boat, I had never beed to Everglades NP. There isn’t much hiking to be had in The Everglades, so I invested in a guidebook for paddlers. That helped me get some basic info about the area. It also made me realize what I was most interested in seeing and doing. I wanted to paddle through narrow mangrove tunnels and to camp on a chickee. The easiest trail with access to both was the Hells Bay Canoe Trail. I arrived in Florida late at night and decided to start early the next morning. I borrowed my step-father’s Ford Explorer and made the twoish hour drive south to Tours in the Glades at the Everglades International Hostel. They rented me a two-person canoe (not sure why I couldn’t get a 1 person canoe or kayak) and helped me figure out how to mount the canoe on the car safely–though I was still nervous. I definitely recommend Tours in Glades if you are headed towards the Flamingo area of the park. A National Park Service employee recommended them over the outfitter in Flamingo. I did, though, have to put up with a long speech about how the book Into the Wild inspired a ton of young men to head recklessly into the woods alone. I explained that I was only going for 1 night, had plenty of food, a tent, a camping stove, and a waterproof emergency satellite messenger, but in the end I still had to listen to their stump speech. After getting my canoe, I drove to the Flamingo Visitor Center to pick up my backcountry permit. The above photo of a Burmese Python swallowing an ibis was on display at the desk. I didn’t think much of it at the time, but I would later. From there it was off to the Hell’s Bay Canoe Trail. The road through the southern section of Everglades NP is about 40 miles long and beautiful. It is mostly dead straight and flat, but it provides off-and-on views into grassland. As the wind blows across the wetlands, the brush floats back and forth in waves. It is mesmerizing. It doesn’t though, feel like the sort of place that you can begin a paddling trip. Still, right on cue, there was a small pull off, gravel to park on, and a small dock to launch from. Since this was my first solo trip and after the Into the Wild lecture I had received just hours earlier, I felt obliged to take a photo that could grace the cover of my book should something go wrong. The lower photo gives you a view into the mangrove tunnels that occupy the first couple miles of the Hells Bay Canoe Trail. This trail is AMAZING! It is about 3.5 miles to the Pearl Bay Chickee, and the first 3 miles of that is spent weaving in and out of a mangrove maze. Hells Bay got its name from the old time hunters who described it as “Hell to get into and hell to get out off.” The route is so confusing that the NPS installed PVC pipe markers to guide the way. Every 100 yards or whenever the trail takes a sharp turn, a short piece of pipe sticks out of the water. I had to pay close attention to avoid missing them (only missed one!). Below is the Google Maps satellite image of the start of the Hells Bay Canoe Trail. You can see a canoe (for scale) a little ways from the road. You may need to zoom in! More difficult was trying to navigate the 6 foot wide path and hairpin turns of the mangroves in my 2-person canoe. While the mangroves sheltered me from the wind, they made steering difficult. If I found myself at the wrong angle my bow or stern would wedge into the vegetation forcing me to back up and correct. About 30 yards from the launch, I managed to get both my bow and stern stuck in the mangroves. I had to walk back and forth from front to back pulling and pushing on the roots to wedge myself free. That didn’t instill a lot of confidence, but eventually I got the hang of it and started to make progress. After paddling for about an hour and getting the hang of steering, I was feeling confident enough to enjoy a particularly narrow and overgrown section of the trail where the mangroves formed a tunnel. As I came around the corner I saw something move in the water a few yards in front of me. Immediately that image from the visitor center flashed back into my mind as I realized I was staring at a Burmese Python swimming in the middle of the trail. We looked at each other for a few moments while my heart raced and then it slithered its way through the water and into the mangroves. Once it was nearly out of sight, I paddled on feeling thoroughly rattled. Burmese Pythons are not native to The Everglades (hence Burmese!). They are originally from Southeast Asia but enough have escaped/been let go that they have developed a self-sustained population in Florida. They are such dominant hunters that they are outcompeting many of the indigenous species. The National Park Service has done their best to remove them, but the environment isn’t conducive to tracking them. A few years ago they had a tournament to catch as many Burmese Pythons as possible. They invited snake hunters from all over and offered cash prizes as well as the chance to become a full-time NPS snake hunter. The event lasted a month and 1500 hunters signed up. In that time they caught only 50 snakes. The only hope of limiting the population is for Florida to undergo an extended cold-snap, but even that might not do it. Eventually I regained my composure–despite getting a shoulder brushing from a snakeskin dangling from a tree– and continued on. After a few miles, the trail opens up to increasingly larger bays. My ultimate destination was the Pearl Bay chickee. The increased expanse of water was a nice change, but introduced me to a serious issue with paddling a two-person canoe alone. My weight at the rear of the canoe lifted the front out of the water. I threw all of my gear up front, but that did little to help the problem. This wasn’t an issue in the mangroves, but in the open water the wind would regularly catch the front of the canoe and spin me in the wrong direction. I tried paddling closer to the shore, paddling from the front, paddling from the middle, and everything else that I could come up with. In the end, I just had to muscle my way through the more open areas. The wind was relatively weak, so I wasn’t too concerned, but I could have had an issue if a storm blew in. By the time I reached the Pearl Bay Chickee, I was tired but excited. Chickees are essentially platform docks with roofs that the NPS has built to allow for camping in the Everglades. Except for beaches along the coast, most of the land is too wet camp on, so instead you get to sleep on sweet platforms out over the water. Here is a the Google Maps satellite image of the Pearl Bay Chickee. Zoom out to see how remote the location is. I set up my tent and then cooked dinner as the sun set. The wind died down and the mosquitoes came out. I made the mistake of wearing a shirt that wasn’t mosquito proof, and they annihilated me. I learned my lesson there. It was worth it, though, for the sunset. While there had been a gentle breeze all day, the chickee was built in the lee of a small cove. After sunset the wind essentially disappeared and it started to feel really hot! I have a sleeping bag rate for 30 degrees and it was about 85. Even sleeping on top of my bag was too warm. Eventually I fell asleep, but it was not my best night of sleep. I woke before sunrise and made breakfast while the sky tested out some new paint colors. After struggling across Pearl Bay with almost no wind, I used my satellite messenger to get a weather update. The forecast was breezy with thunderstorms and the probability of storms increasing throughout the day. With that news, I left the chickee before 7 AM, still struggling to keep the canoe pointing in the right direction. I was worried but thought I would still be able to make it despite the increasing winds. I also knew there were at least two couples behind me who would be able to help if I got stuck. At least the weather helped me to keep my mind off of the pythons! I worked my way back from the bays into the mangroves and watched the sky grow grayer and darker. Drizzling rain fell off and on until the wind suddenly picked up and the skies opened. It was like standing in a shower with 4 shower heads. Raindrops thumped the bottom of my canoe forming a pool at my feet and the water danced as the droplets made that overpowering and magical sound of a serious rainstorm. I was soaked by happy. Ten minutes later the storm was over. I bailed out my canoe and continued following the PVC markers back to the launch. Despite horrible mosquitoes, an 85 degree night, a run in with a snake, a canoe with a broken steering wheel, and a dramatic rain storm, I was had survived my solo trip, and I cannot wait to go back! I just moved to Florida and I was wandering if I can do the trail in a SUP, I tried to find information about that but I couldn’t find anything. If you know something please let me know. I will definitely go on my SUP or canoe!! I think this trail could be great on your SUP. I haven’t gotten the chance to try SUP, but I know a little about it. There aren’t many parts of the trail that are so overgrown that you wouldn’t be able to stand, but there are those parts. As a warning, I found it hard to make some of the turns in a 2-person canoe, so if your SUP is long, you may experience some of the same challenges I did. But, that’s no reason to skip the trail.